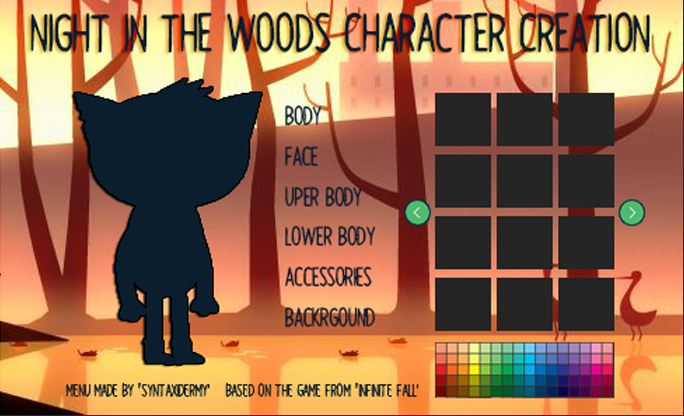 The sprite is made using just one layer, at the moment. Essentially, while I don't think the concept is too difficult to put together, I'm having trouble finding examples of how to implement relevant sections of code using Phaser 3. If you might be able to give me some examples or resources to look into as to how I could build some of the features, I would greatly appreciate that. -Building multiple menus of images, each accessible by clicking on relevant category titles. Thanks for having a look, hopefully gathering some examples in one place will help the next person trying to make a similar game too. An update here if anybody else is looking for guidance on building menus of the style above, here's what I did to make mine. Hope this helps. //helper function for menuOptions(). Ensures page index does not go out of bounds. //When user clicks any text section it triggers displaying of relevant item icons. //just an array of interactive text objects.